Nasopharyngeal carcinoma, Laminaria japonica polysaccharide (LJP), Cell cycle, Apoptosis. Nasopharyngeal Carcinoma (NPC) is one of the most common malignant tumors in our country, and it is now often treated with comprehensive therapy of radiotherapy and chemotherapy, but the side effects caused by chemotherapy should not be ignored. NPC is cancer that occurs in the nasopharynx, which is located behind your nose and above the back of your throat. NPC is difficult to detect early. Treatment for NPC involves radiation therapy, surgery or a combination. Radiation therapy uses X-rays to prevent cancer cells in patient’s body. It is usually part of the standard treatment for NPC. It is the most common treatment strategy which people use now. Besides radiation, surgery can sometimes cure NPC if the tumor cells are removed to other parts of the body. However, the surgery can be dangerous because of the tumor’s location close to the skull. It may results to serious damage to the eye and other nearby structures. L. japonica polysaccharides (LJP) have been used for detumescence and elimination phlegm in traditional Chinese medicine has nutritional value and many functions associated to health. Other research studies showed that polysaccharides are the biological components of LJP are natural macromolecular substances found in the intercellular or intracellular environment. LJP is considered as a kind of immune modulator that can enhance the immune function of human body to inhibit tumor biological activity with a minor side effect . Several studies showed that besides anti-tumor and anti-virus properties, LJP also has anti-radiation effect. 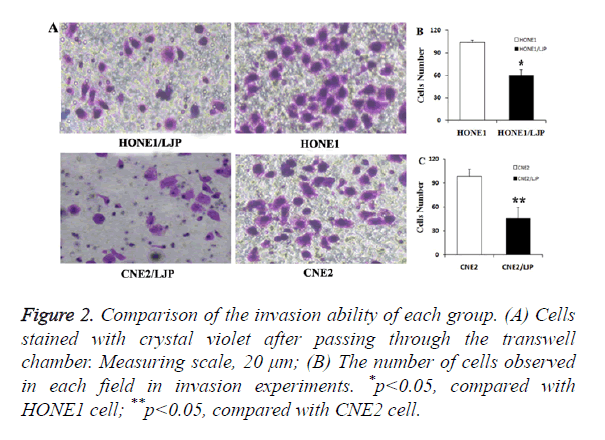 In this study, we investigated the effects of LJP in vitro on the biological activity of nasopharyngeal carcinoma cells and studied the anti-cancer mechanism through LJP’s action on the HONE1 and CNE2 cell lines. We detected LJP function on cell proliferation, cell cycle and cell apoptosis process and try to figure out the detail of LJP function on NPC treatment. It can provide new possibility for NPC treatment. Laminaria Japonica Polysaccharide (LJP) is produced by Shanxi Ciyuan Biotech Co., Ltd. IMEM medium and foetal bovine serum: produced by Thermo company; trypsin and PBS solution: produced by Boster Co., Ltd. Wuhan; human nasopharyngeal carcinoma HONE1 and CNE2 cell lines produced by KGI Nanjing Biological Technology Development Co., Ltd. MTT produced by Sigma company; the goat anti-rabbit antibody IgG secondary antibody, GAPDH: Biosharp company; pipette tip, culturing bottle, centrifuge tube, matrigel glue, transwell chamber: America CORNING; Rabbit anti-Huma Bax and Bcl-2 monoclonal antibody, β-actin: Abcam. The human nasopharyngeal carcinoma cell lines of HONE1 and CNE2 of normal growth were inoculated into 5 cm × 5 cm culture bottle, IMEM medium containing 10% foetal bovine serum, 1% penicillin and 1% streptomycin was added. The above compound was cultured at 37°C with 5% CO2. Change the liquid after 48 h of conventional culture; the cells were digested by trypsin while growing to about 80% area of the culture bottle. The HONE1 and CNE2 cells at the exponential growth stage were respectively collected and the polysaccharide was added into the normal culture medium, and the drug concentration was adjusted to160 mg/L for continuous culture of 48 h. The two cell groups without laminarin treatment were named HONE1 group and CNE2 group while the two groups with the laminarin treatment were named HONE1/LJP group and CNE2/LJP group (Cells with 48 h of LJP effects were immediately conducted after the next step of the experiment). Four groups of cells at exponential growth phase were digested and centrifugalized, and density of single cell suspension was adjusted to 3 × 104/ml with medium, 100 μl single cell suspension (edge well was added 100 μl distilled water) was added to each well of 96 wells plate respectively with a total of 25 wells of each group. After 4 h, cell adhesion was observed under the microscope. Then 5 wells taken from each group were added 20 μl 5mg/ml MTT solution and supernatant was aspirated away after a continuous culture of 4 h with each well added 150 μl DMSO, 3 min of oscillation was performed to fully dissolve the crystal (the number of 5 wells were detected every 24 h with the continuous testing of 5 d); Optical Density (OD value) was detected with micro plate reader (Bio-Tex synerg2) on the condition of 490 nm wavelength. The growth curves in various groups were drawn according to the data. The upper chamber of each transwell chamber was added with 60 μl Matrigel glue of an overnight thaw at 4°C (with IMEM medium diluted at diluted six times) and was placed in temperature box of 37°C for 4 h for a period of 4 h until the coagulation of Matrigel gel. Cells at exponential growth phase in four groups were digested and centrifuged and single cell suspension density was adjusted to 8 × 104/ml with culture liquid; then 200 μl cell suspension of each group was added to each upper transwell chamber while 500 μl IMEM containing 10% FBS was added to the lower chamber; After 24 h of culture at 37°C and on the condition of 5% CO2, extra fluid was carefully flushed from the chamber and was inverted into the filter paper for 2 min; Nasopharyngeal carcinoma cells without passing through were removed with cotton swab with a fixation of 15 min at the room temperature (4% paraformaldehyde) and a dying for 20 min (0.1% liquid crystal violet staining). Cells were observed, photographed and counted after air drying; (5 fields were randomly selected from each chamber). Three replicates were established. Cells at exponential growth phase in four groups were digested and centrifuged and single cell suspension density was adjusted to 5 × 105 ml with culture liquid. The cells were inoculated in 6-wells plates, with the cell number of each well reaching about 2 million, the cells were collected for PI staining after continuing to culture for 24 h and cells cycle of the 4 groups was detected by way of flow cytometry. Four groups of cells at exponential growth phase were digested and centrifuged and the protein was extracted with lysate (PMSF: RIPA=1:100), and the total protein content in each group was measured by protein quantitative method. The loading quantity of protein was 50 μg. Electrophoresis was carried out with 5% separating gels and 10% concentration gels for 1 h followed by another 1 h of electrophoresis with constant 100 V. After the electrophoresis, 0.44 μm VDF membranes were adopted to conduct trans-membrane on the condition of ice bath and 2 h constant current. Then the liquid was put at 4°C overnight. Primary antibody was incubated at 4°C overnight (Bax, Bcl-2 monoclonal antibody, p-mTOR, p- AKT), the next day after washing the membrane three times (TBST twice, TBS once, 10 min/ once), incubation of the secondary antibody was conducted at 37°C (IgG antibody) for 1 h, and after repeating once the above membrane washing of 3 times with the same method, the ECL developer was adopted for exposure. Quantity One software (Bio-Rad) was applied to detect gray-scale value of straps. Measurement data were described as mean ± SD. T-test was applied with statistical significant of P<0.05. Statistical software: SPSS 16.0 and Microsoft office excel. Growth curves were drawn with the growth time as abscissa and the OD value as the ordinate. The formula of each group was respectively as follows: HONE1 group: y=0.0278x +0.0286; CNE2 group: y=0.0269x+0.0433; HONE1/LJP group: y=0.0165x+0.0383; CNE2/LJP: y=0.0221x+0.0415. The result showed that the proliferation ability of the two groups treated by Laminaria japonica polysaccharide (P<0.05) was decreased (P<0.05) (Figure 1). Figure 1. Growth curve of each cell lines. #p<0.05, compared with HONE1 cell; *p<0.05, compared with CNE2 cell. The number of cells without passing through in each group was as follows: HONE1 group: (103.67 ± 3.63); CNE2: (98.53 ± 8.82); HONE1/LJP: (59.89 ± 8.19); CNE2/LJP: (45.72 ± 13.91). The result showed that the invasion ability of two groups of cells treated by Laminaria japonica polysaccharide decreased (P<0.05) (Figure 2). Figure 2. Comparison of the invasion ability of each group. (A) Cells stained with crystal violet after passing through the transwell chamber. Measuring scale, 20 μm; (B) The number of cells observed in each field in invasion experiments. 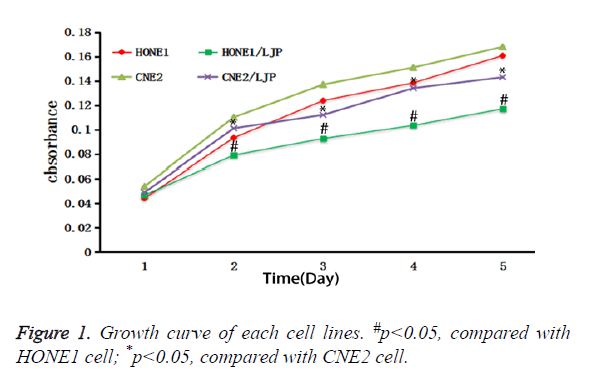 *p<0.05, compared with HONE1 cell; **p<0.05, compared with CNE2 cell. Compared with the HONE1 group, the proportion of G0/G1 phase in the HONE1/LJP group increased while the proportion of S phase decreased. Compared with the CNE2 group, the proportion of G0/G1 phase in the CNE2/LJP group increased while the proportion of S phase decreased. The results showed that the two groups of human nasopharyngeal carcinoma cells were blocked at G0/G1 phase and then ended up with apoptosis by treatment with LJP (Figure 3). Figure 3. Effects of LPS on the cell cycle distribution in each cell line. Experimental results of Western blot: Compared with HONE1 group and CNE2 group without the laminarin treatment, the expression of Bax and Bcl-2 (Figure 4A) were up-regulated in HONE1/LJS and CNE2/LJS group; Bax and Bcl-2 ratio increase dramatically (Figure 4B). Besides, p-AKT and p-mTOR also showed low expression (Figure 5), indicating that LJP blocked PI3K/AKT/mTOR signalling pathway, intervened phosphorylation of AKT and mTOR and finally promote the apoptosis of cells. Figure 4. Effects of LJP on Bax and Bcl-2. (A) The expression of Bax and Bcl-2 of four groups; (B) Bax/Bcl-2 of each group; *p<0.05, compared with HONE1 cell; **p<0.01, compared with CNE2 cell. Figure 5. Effects of LJP on expression of p-AKT and p-mTOR. (A) The expression of p-AKT and p-mTOR in each group; (B) p-AKT/β- acting and p-mTOR/β-Actin ration of each group; *p<0.05, compared with HONE1 cell; **p<0.05, compared with CNE2 cell. Laminaria japonica polysaccharide, as one effective component extracted from brown algae, mainly contains monosaccharide fucoid galactose sulfate. In the study by Vishchuk et al., laminaria polysaccharide sulfate can reduce the cell colony of breast cancer cells by 21% . LJP also can inhibit the proliferation of human nasopharyngeal carcinoma HONE1 and CNE2 cells . In this study, the growth curves of cells with 48 h of Laminaria japonica polysaccharide treatment also confirmed that Laminaria japonica polysaccharide could reduce the proliferation and invasion ability of nasopharyngeal carcinoma cells at the same time. At present, the main cause of tumor is generally thought because of changes of various physical and chemical factors which leading to the unbalance of cell proliferation and apoptosis while the expression of tumor suppressor genes is down regulated with amplification of oncogene . Therefore, the production, invasion and metastasis of tumor are closely related to apoptosis. Apoptosis of normal body cells is controlled by various complex signal pathways, in which once there are abnormal factors such as abnormal expression of tumor suppressor gene Bax or proto-oncogene Bcl-2, which leads to cell variation, eventually causes the generation of malignant tumors . The results of this study showed that apoptosis related protein Bax and Bcl-2 of human nasopharyngeal carcinoma HONE1 and CNE2 cells were affected by Laminaria japonica polysaccharide, which up-regulated Bax and down-regulated Bcl-2, indicating that cells lines were in the process of apoptosis. Beside this, the role of laminaria japonica polysaccharide in the PI3K/AKT/mTOR signalling pathway had also been demonstrated. The LJP can inhibit the phosphorylation of AKT and mTOR by blocking PI3K/AKT/mTOR, which affects the expression of Bax and Bcl-2. Cell cycle can be divided into interphase (G1, S, G2) and division stage (M) with two nodes (G1/S and G2/M) . Xiao et al. found that LJP had good inhibitory effects on rat brain glioma cells and promoted the apoptosis of tumor cells by blocking them at G0/G1 phase . Our experiment confirmed that LJP had similar function mechanism in nasopharyngeal carcinoma cells: inhibit cell cycle from G1 to S phase to reduce the number of capable of DNA synthesis cells, preventing tumor cells from synthesizing genetic materials and ultimately result in the apoptosis of nasopharyngeal carcinoma cells by affecting their growth and metabolism. In addition, LJP can improve immune function and facilitate its recovery by enhancing the activity of macrophages and improving the prognosis of patients by intervening the immune function injuries caused by chemotherapy or radiotherapy [8,9]. Other scholars have confirmed that LJP can stimulate the secretion of interleukin-1 and promote the proliferation of thymocytes, thereby improving the cellular and humoral immunity to enhance the immune function . Therefore, in view of the immune function damages caused by chemotherapy or radiotherapy, LJP can be adopted as adjuvant therapy in clinical practices to change the process of natural restoration of immune system. It has great influence on prevention and treatment of nasopharyngeal carcinoma. The mechanism on the immune system needs to be further studied. To sum up, LJP can promote the apoptosis of nasopharyngeal carcinoma cells by blocking them at G0/G1 phase by regulating of related genes like Bax and Bcl-2. It can serve as adjuvant therapy for nasopharyngeal carcinoma to reduce the dosage of chemotherapy drugs and improve the body immunity. Besides, it also can improve the quality of life of patients with nasopharyngeal carcinoma by reducing the incidence of adverse reactions. The results of this study provide an experimental basis for further exploring the molecular mechanism of Laminaria japonica polysaccharide on human nasopharyngeal carcinoma HONE1 and CNE2 cell lines and meanwhile offer a theoretical basis for the clinical treatment of nasopharyngeal carcinoma. Lei X. Research advances on medicinal value of laminaria japonica polysaccharide. J Anhui Agricul Sci 2015; 388-390. Vishchuk OS, Ermakova SP, Zvyagintseva TN. Sulfated polysaccharides from brown seaweeds Saccharina japonica and Undaria pinnatifida: isolation, structural characteristics, and antitumor activity. Carbohydr Res 2011; 346: 2769-2776. Sun WZ, Wei YY, Zeng ML. The effects of tea ployphenols and laminaria japonica polysaccharides on nasopharyngeal carcinoma cell HONE1and CNE2. J Clin Otorhinolaryngl Head Neck Surg 2013; 425-428. Ding J, Wang H. Multiple interactive factors in hepatocarcinogenesis. Cancer Lett 2014; 346: 17-23. Xin M, Li R, Xie M. Small-molecule Bax agonists for cancer therapy. Nature Comm 2014; 5: 4935-4935. Wu S, Rice JC. A new regulator of the cell cycle. Bratislavské Lekárske Listy 2016; 117: 111-127. Li X, Xu CS, Zhao YF. Laminaria polysaccharide sulphate inhibited the proliferation of brain tumor cells. Chin J Biochem Pharma 2012; 33: 399-401. Zhang W, Oda T, Yu Q. Fucoidan from Macrocystis pyrifera has powerful immune-modulatory effects compared to three other fucoidans. Marine Drugs 2015; 13: 1084-1104. Robertson RC, Guihéneuf F, Bahar B. The anti-inflammatory effect of algae-derived lipid extracts on Lipopolysaccharide (LPS)-stimulated human THP-1 macrophages. Marine Drugs 2015; 13: 5402-5424. Aguilarbriseño JA, Cruzsuarez LE, Sassi JF. Sulphated polysaccharides from Ulva Clathrata and Cladosiphon Okamuranus seaweeds both inhibit viral attachment/entry and cell-cell fusion, in NDV infection. Marine Drugs 2015; 13: 697-712.